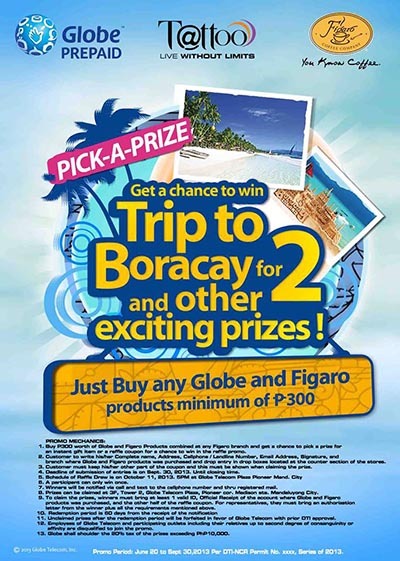 Buy any Figaro and Globe products at any of Figaro stores and get a chance to Win a Trip to Boracay for 2 and other exciting prizes! Buy P300 worth of Globe and Figaro products combined at any Figaro branch and get a chance to pick a prize for an instant gift item or a raffle coupon for a chance to win in the raffle promo. Customer to write/ fill-in the ff. and drop entry in drop boxes located at the counter section of the stores. Customer must keep the other side of the coupon and must be shown when claiming the prize. Visit Figaro Coffee Company Facebook page for more details.